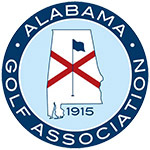 ATHENS, AL (June 22, 2018) – The 28th Alabama Women’s Stroke Play Championship concluded today at Canebrake Club. The morning got off to a cool, yet dry start however dangerous weather conditions in the area halted play at 12:05p.m. The players resumed play at 1:25 p.m. following an hour and 20 minute delay. Michaela Morard of Huntsville went wire-to-wire to take home the trophy and Gold medal to become a two-time Alabama Women’s Stroke Play Champion. She carded eight birdies in her final round of six-under 66 giving her a total of 195 (-21) to win by eleven shots. Her 195 smashes the record for lowest 54-hole score in championship history. Previous record was set by Morard back in 2016 with a 215 total at TP Country Club in Cullman. Hoover’s Mychael O’Berry finished in solo second for the Silver medal following a final round one-under par 71 for a total of 206 (-10). O’Berry carded four birdies and two bogeys for her round. Bronze medal went to Point Clear’s Virginia Green who holed out from the bunker on eighteen for eagle to secure her prize. Green fired a solid three-under 69 in the final round for a 210 (-6) total. Defending champion Cammie Bentley of Northport finished strong with a one-under 71 in the final round to place in fourth. Her 214 (-2) total earned her the medal for low Mid-Amateur player in the field. Low Mid-Amateur award was introduced this year for player’s age 25-years-old and up. 54 holes of gross individual stroke play championship. Entries are open to any female amateur golfer who is a legal resident of Alabama and has an active GHIN® USGA Handicap Index® at an AGA member club. There will be three divisions: Championship, Tournament and Senior.